We have helped produce many unique sweepstakes prizes and rare gifts for our clients promotional needs. There are some things money can’t buy, and a few of those things can only be won or received as a gift. For years we have been creating limited edition unique items for our clients to use as promotional giveaways, sweepstakes prizes, and influencer gifts. Many of these items become sought after as high-end collectables because they cannot be purchased anywhere. The most rare and coveted items we produced were our first – a small exclusive run of Bane’s mask from the Batman film The Dark Knight Rises. These masks were used by Warner Bros. in a cross-branding sweepstakes campaign with Mountain Dew to promote the long awaited finale in the Dark Knight trilogy. Since we created the masks worn by Tom Hardy in the original film, it was easy for us to recreate the masks for the sweepstakes using our same molds and patterns. They were exact replicas of the film’s masks right down to the hand painted details. In addition to high-end details, we have also designed built-in safety features for some items that could mistakenly be used for something other than their displayed purpose. For example, the run of replica claws we formed from adamantium as promotional sweepstakes prizes for the film Wolverine and then again for Logan, were placed in sealed cases and were engineered with safety features that disabled the use of the claws as potential weapons. eye for detail has been cultivated over the years through our long history in the film and television industries and has grounded us with the ability to creatively produce high-end pieces on compact budgets with very tight deadlines. Along with superior design and craftsmanship we also offer top-notch packaging to protect and ship these rare items, insuring they arrive at their destination intact. Whether you are looking for unique sweepstakes prizes, distinctive items for influencers, production member gifts, or rare promotional elements, let us know how we can help bring your exclusive event to life. Below you will find a few of the Money Can’t Buy Prizes and Gifts we either designed and/or produced. We produced copies of the Deadpool 2 teacup and plate set used to promote Columbia Record's sweepstakes for the film. We produced over 200 pairs of mounted and framed katanas used as sweepstakes, raffle prizes and production member gifts for the film. The katanas were hand painted to look like metal and were unable to be disassembled and used as actual weapons. We helped to produce high-end limited edition Bane statues used as awards for key members of production for the film. 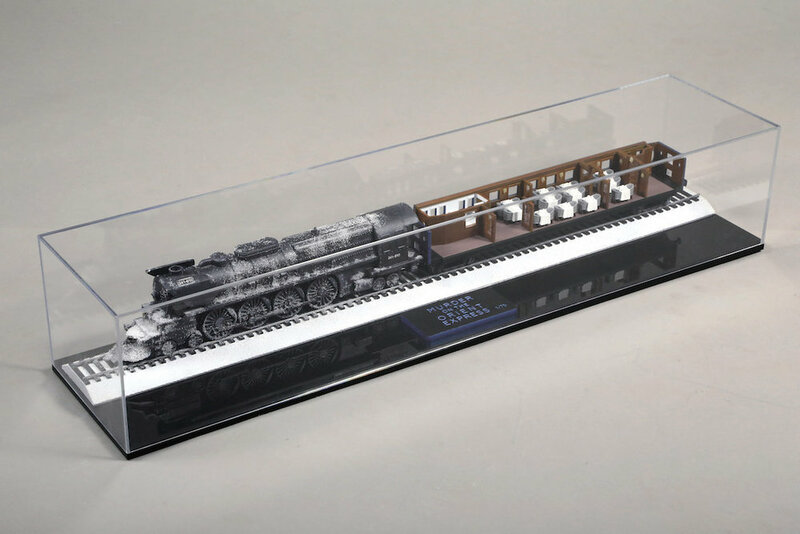 We produced 75 highly detailed, miniature replica engines and open train cars mounted in a display case used as sweepstakes prizes and production member gifts for the film. We created 45 limited edition Damascus blades that were distributed around the world as promotional sweepstakes prizes by 20th Century Fox.